#OrganicSeptember has brought a ton of amazing content, statistics, conversations, and a renewed excitement to organic living, but it also brought something totally new -- a collaboration between The Natural Beauty Box and Ana from Ana Goes Green! Emma announced this collab at the start of September saying "I asked Ana who blogs at @anagoesgreen if she would like to be involved as I knew she had a love and passion for organic skincare products and she said yes, so this month, your box of gorgeous green organic goodies has been specially curated by the lovely Ana and all the products are certified by Soil Association. Here is something I have not mentioned on The ecoLogical before... I am incredibly fussy when it comes to hand cream. I have no idea why that is, as it's not like my hands are super sensitive like my face can be or that I am picky about scents. I just seem to have a love/hate relationship with hand products! So when I saw the first reveal for the September "Organic Beauty" edit from The Natural Beauty Box, I was a little nervous. Would this be another cream I ended up passing off to someone else?? 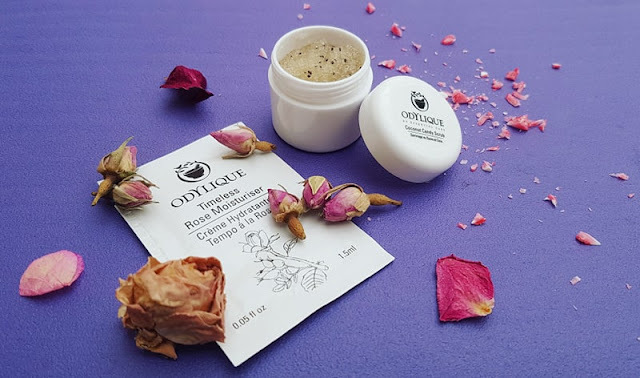 Bentley Organic's rose geranium cream actually fits the bill, being vegan friendly and 88% organic, free from nasties, delicately fragranced, and totally non-sticky. There are no harsh alcohols in this formula, just nourishing butters and oils, meaning you can depend on it to restore and protect just like it promises on the label. While I did not find this hand cream the most moisturizing I have ever tried, it is a great option for anyone who just needs a bit of an extra boost during harsher weather or who just wants a nice treat for their skin. 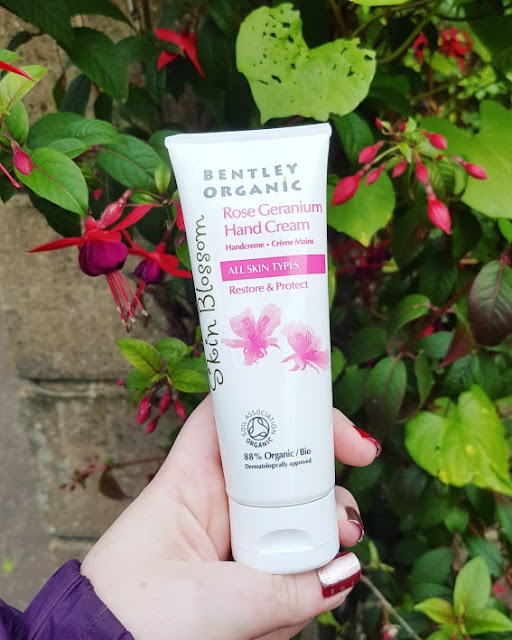 Anything that adds moisture and helps protect the hands is worthwhile, especially something like Bentley Organic's cream that is full of plant based ingredients that help fight dryness. The texture is super smooth and spreads easily without being oily, and it sinks into the skin so quickly which is a huge plus for those of us who can't wait for a product to dry down! Plus, it smells lovely, like a rose bush. Overall, I am well pleased with this hand cream and am very happy to have been introduced to a brand I had not experienced before. This is a brand I discovered a long while back, but have yet to review on the blog. When I saw this reveal, I was hesitant for a moment, as my first experience with Herbfarmacy is when I excitedly bought a mist only to discover the formula contained the dreaded phenoxyethonal -- talk about disappointing! I appreciate that the brand addresses the use of this ingredient in their FAQ, but even though this preservative is allowed by Soil Association and is used sparingly, it still causes a reaction and I steer clear of it. I have since looked into each of Herbfarmacy's products' ingredient lists individually, and found which are free from this sensitizing preservative and have had great results (perhaps a brand spotlight should be in the works? what do you think??). And luckily, the TLC Balm is on my list of Bryanna approved Herbfarmacy goodies, so I happily get to try another lovely creation from this vegan-friendly brand. The first thing I have to mention is the gorgeous packaging, as it is just too pretty to skip over. While I am not usually keen on 'extras' when it comes to products, Herbfarmacy's boxes are so cute that I will go out of my way to find a second life for the cardboard (in this case, I will be storing dried petals inside!). The brand's focus on utilizing the power of nature to create effective skincare is perfectly represented in the creative packaging, and it suggests a homely element to the business that is so refreshing. And indeed, Herbfarmacy is a brand that is both personal and domestic. "Tucked down a narrow country lane, our five-acre farm is home to a range of skin-conditioning herbs and flowers. From the rows of bright Calendula to the soothing fields of our signature herb Marshmallow, time and patience is our secret to harvesting the finest ingredients to use in our award-winning skin care range." This sentiment is captured in the simple artistic design on both the outer box and the product label itself, and And best yet? It is all plastic free!! The product itself is just as beautiful as the materials housing it -- so smooth, ultra-calming, and nourishing. The TLC Balm is an utter dream in all aspects. 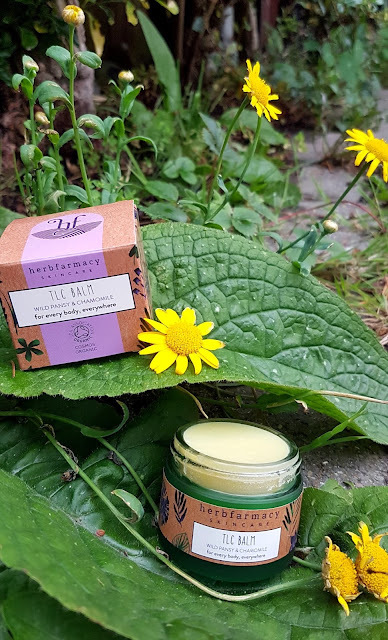 Herfarmacy says "We wanted to make a balm that was suitable for every body: young or old, female or male, vegan or not, even those with ultra-sensitive skin" and they certainly delivered just that. So far I have successfully used this balm on my cuticles, dry patches on elbows and knees, my legs after shaving, and on my temples as a soothing aromatherapy treatment. This may be my favourite balm yet actually, and I can't wait to discover even more uses as I continue to work my way through the jar. 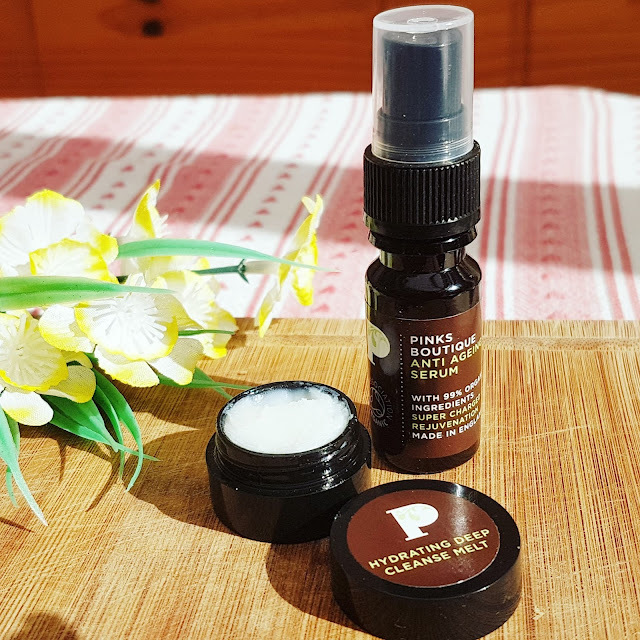 I have been wanting to try Pinks Boutique range of products for absolute AGES, so when I saw Ana had chosen to include this duo in the organic edit for The Natural Beauty Box I was over the moon. Finally I would get to experience this lovely brand for myself! Both the Hydrating Deep Cleanse Melt and the Anti-Ageing Serum have such an uplifting smell which was just what I needed the last week. The aromas are calming yet boosting, and both feel so luxurious on the skin. I was honestly really thankful the September edit of The Natural Beauty Box arrived when it did, as I was in serious need of soothing and energizing scents to help get me through a rough time. The cleanser is not your average balm, as it is so quick to melt into a super silky texture that just glides across the skin. While it is very oil-heavy, I was not too worried about my skin getting congested as the ingredients are all relatively light (no coconut oil thank goodness!). I can usually tell after a few hours if my skin will break out, and I had no such feeling after cleansing with Pink Boutique's Deep Cleanse Melt. And no spots the next day either! One thing I do recommend though (unless you have extremely dry skin) is to either double cleanse when using this product or to skip the extra moisture boost afterwards, as this does the trick on its own. While I do not need anti-ageing skincare, I was curious to see how this serum would work on my semi-sensitive face. Most products like this tend to be too heavy and lead to unseemly spots, but I figured the cleanser was such a hit that I had to give it a go! Well, as gorgeous as the oil itself is (it smells of a fab infusion of tea tree and lavender and is so so hydrating! ), unfortunately this one is indeed a little slick for me at the moment. 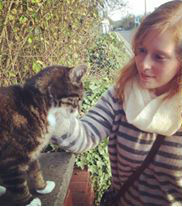 However, this means my partner lucks out and gets another new treat! I have been using a little on my neck and décolletage with positive results though, so at least I get to enjoy it too! Me: What does it smell of? Cleanser Ingredients: Helianthus annuus (sunflower) seed oil*, butyrospermum parkii (shea) butter*, cetyl alcohol, cetearyl alcohol, glycerine***, sesamum indicum (sesame) seed oil,* decyl glucoside, cocos nucifero (coconut) oil*, ricinus communis (castor) seed oil*, calendula offcinalis leaf extract*, tocopherol, zea mays seed flour*, parfum*; lavendula angustifolia (lavender) flower oil*, anthemis nobilis (chamomile) flower oil*, citrus nobilis (mandarin orange) peel oil*, geraniol**, limonene**, linalool**. (*Certified organic. **Natural constituent of essential oils. ***Organic origin). The few Odylique products I have tried have been so lovely, and the Coconut Candy Scrub is no exception. 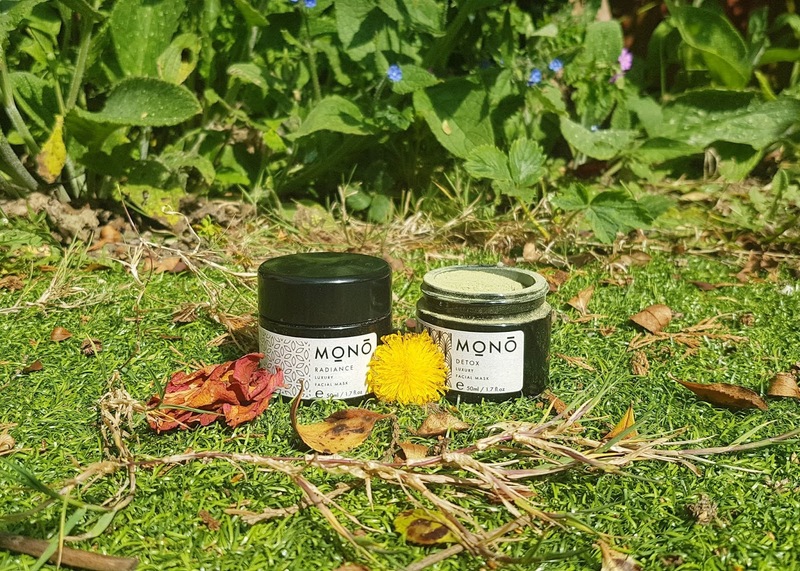 100% natural, 98% organic, and totally mouth-wateringly scrumptious to smell, this vegan body scrub is just what we all need to get in the mood for colder weather (and Christmas if I dare say!). And while I have not yet tried out the bonus sample of Timeless Rose Moisturiser, I have high hopes that it will be just as delightful to use! "A deeply exfoliating and luxurious organic body scrub that offers exceptional results and compatibility with the most challenged skin. Feel transported to a tropical island with the heavenly fragrance of virgin coconut and cocoa bean butters whilst cell renewal is gently stimulated, your skin is polished and left silky smooth." I might not describe it as a tropical island, but the scrub is definitely candy-licious. And it doesn't just smell good, it feels good! Unlike some scrubs that are far too grainy and gritty, this one is gentle and extra hydrating due to the oils and butters. In fact, it is more like an exfoliating mask more than a standard scrub! No matter the term, this formula is one my skin loves and I will be looking into getting a full size later down the road. This is another brand that has been on my radar and wish list for ages now, but I just have not been able to afford to splurge. 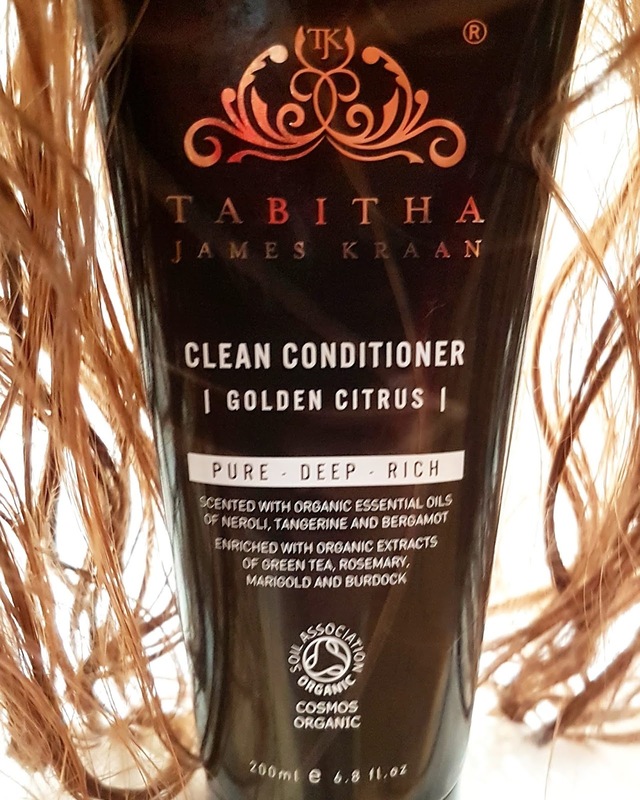 Tabitha James Kraan is British made, multi-award winning, and 100% pure, and it is a name I have heard paired only with compliments. Their range of hair care products follows three main principles: oil-balancing, moisture layering, and correct cleansing. But I have to be honest -- when I first learned how much this cost I thought there was no way it could be worth it. A conditioner that is £32??? I struggle to rationalize spending over a tenner on shampoo and conditioner on a good day, so this was a shock to the system. But, then I saw the really generous size and thought at 200ml it was definitely a bit more reasonable considering how long this type of product usually lasts me personally. So is this worth the price? My bank balance must sadly admit it is. The smell is divine (I get a hint of vanilla, but there is no vanilla -what is this magic?? ), the formula really moisturizing, and the results are smooth and soft hair without any oily residue. While I still prefer using an oil for my hair as opposed to a traditional conditioner, this has got me thinking that maybe it is worth going back to revisit, at least every now and again! Oil is really cost effective and packs a massive hydration punch, but it can leave your locks looking a little grungy if you don't use a tonic to rinse. With this conditioner, I do not need a second product as it rinses out fully while also locking in moisture. This will probably become my 'in between' hair treatment, for the nights before I have to leave early in the morning or for days when I shower right before going out. That way I can nourish my hair but not have to worry about looking like a grease pit! Green Scents is a totally new brand to me, and one I will be investigating more in the future as I love the wide range of products they have on offer. From multi-purpose soaps to loo cleaner, they have every area of the household covered when it comes to keeping this fresh, sanitary, and sparkling. The All Purpose Castille Soap is a great multi-tasker, as it can be used for cleaning hands, teeth, sinks, clothes, hair, and more. Castille soap is a a vegetable based soap that contains olive oil and other 100% natural ingredients. They are free from chemical detergents, artificial foaming agents such as SLS, synthetic colours and fragrances, petrochemicals, and harsh antibacterial agents like triclosan, making it gentle on the environment and on the skin. 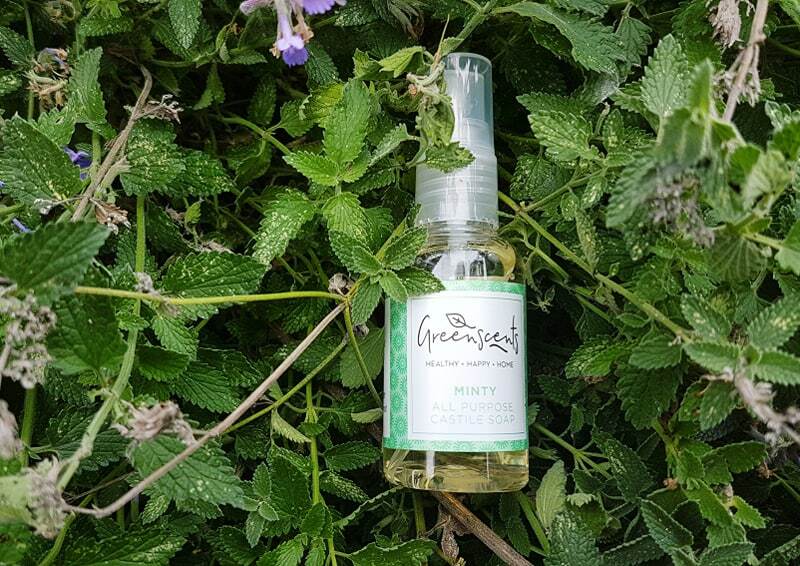 This "Minty" version from Green Scents is so lovely and uplifting, and super potent -- it actually reminds me of the in your face peppermint smell of the Dr Bronners soaps. All you need is to open the bottle and the smell fills the room! The soap is really concentrated, so you only need a few drops for most purposes. There are actually really helpful hints on their website for how much to use and when, so if you are at a loss you can check those out! I also appreciate that the brand is upfront about castille soap being drying on sensitive skin, as many would skip over this fact. While the bottle is plastic, I was happy to see the material is recyclable. Plus, with this being the smallest size available, you can imagine how long the 300ml, 5L, or 20L bottles would last, meaning less plastic is used over time. The 20L option is meant to sort 1,000 machine washes or 4,000 shampoos -- pretty impressive! I am actually a lover of soap nuts, but I may give this a try next time we do our washing as I know my partner prefers a more 'traditional' method. This could be a helpful middle ground that we could compromise on, plus it would save me from having to add essential oils to our washing bag -- I will update as soon as we give it a go! Fushi is not a new brand to me, but it is surely one I have not delved into enough. I mean, I didn't even know they did a 100% pure and organic shea butter! I occasionally try my hand at making my own body and hair butters, lip balms, skin masks, and bath truffles, and this try me pot from Fushi will be the perfect addition to my potions box. I have already started trying some new lip treatment recipes, and I am loving the extra nourishing qualities provided by the shea! My favourite concoction at the moment? Lemongrass and rosemary! 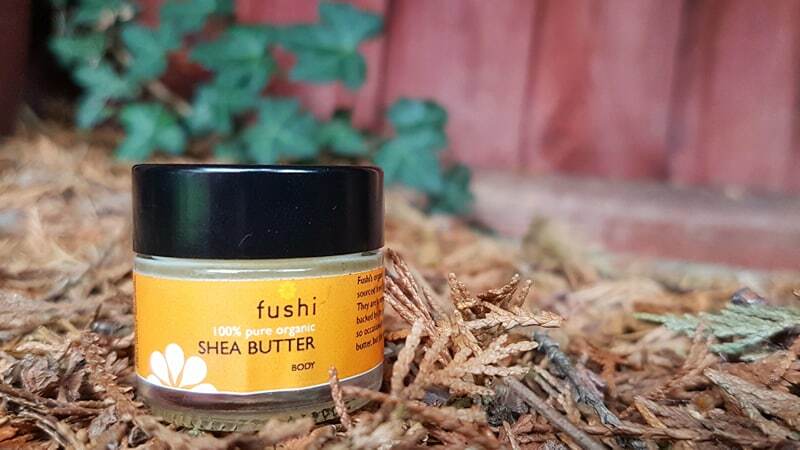 Ingredients: Organic Unrefined RAW Butyrospermum parkii (Shea Butter). Origin Ghana. Handpicked and made by The Yumzaa Women Association. 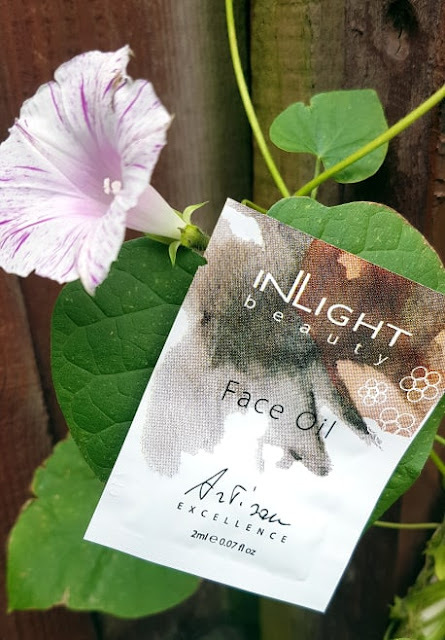 Inlight Beauty is another new one for me, and I am happy to have been introduced to another organic brand that is both focused on creating high quality natural beauty products and also primarily free from plastics in their full size products. "Dr Spiezia's [Inlight's co-founder] 100% organic skincare and wellness products capture the vital power of natural ingredients to regenerate the skin and uplift the soul, bringing beauty to life." The brand was the very first to gain COSMOS certification, and has consistently produced natural beauty treats based on years of research, expertise, and scientific knowledge. Their range covers oils, balms, tonics, cleansers, masks, teas, and more. I have to admit, when I first read the ingredients on this sample I wasn't super excited -- let me explain. The full size 30ml bottle of this costs £42, and for that price range I expect something pretty fantastic. Yet, the ingredients here are very simple and nothing super precious. Don't get me wrong, they are brilliant (and organic) ingredients, and if this were a less expensive product I would be super into it. But who knows, maybe the formula is so expertly blended that simplicity becomes something unexpected. Either way, I have a feeling I will love this oil -- it sounds like it will be great for my skin type and will leave me moisturized without making me break out. I will definitely provide a full update in my empties post when this gets used up! Ingredients: Simmondsia chinensis, Rosa rubiginosa, Rosa damascena, Oenothera biennis, Vanilla planifolia, Malva sylvestris, Rosa canina, Lavandula angustifolia, Rosa damascena, Linalool*, geraniol*, citronellol*, limonene*. 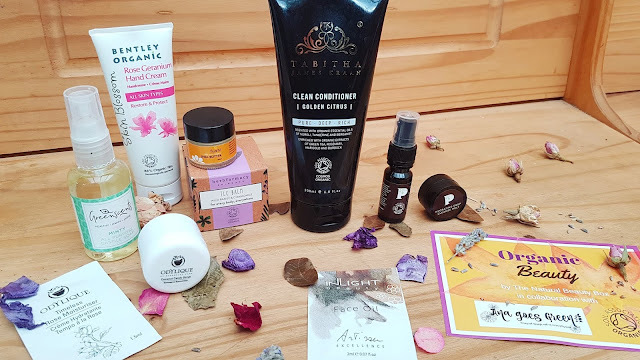 This is the first collaboration The Natural Beauty Box has ever done, and I think Ana did an exceptional job selecting Soil Association certified skin treats. Everything is perfectly suited for the changing weather, with all products targeting hydration and healthy cell renewal. I love that many of these brands are new to me, and that this collection included several surprise samples -- it is always exciting to have some bonus products added in! Overall, the Organic Beauty edit of The Natural Beauty Box is worth £73.45, making this an INCREDIBLE savings (over £48!). I thought this was a brilliant edition, but I want to know your opinions -- did you love all the organic goodies? What was your favourite item? Were you as excited about this collab as I was?? Let me know in the comments below! If you are looking into subscribing, be sure to do so before the edition sells out. Each month there is more and more interest and the boxes sell out pretty fast! Don't worry though, you will have time to see a few spoilers of the upcoming theme over on The Natural Beauty Box's Instagram account before you have to decide if you are still a little unsure. But when you are ready, remember to use this link to grab 10% off your first box! What a great selection of products, I love this collaboration! This all sounds amazing, especially the hand cream. I need to have a look into this box! I've never heard of The Natural Beauty Box, how have you found it? ooh this all looks so lovely. I have never had a box like this so would love to maybe try one out some time soon. This box looks great, such lovely products! I love the sound of that coconut candy scrub! What a great selection of products, and it's really helpful that they're all Soil Association approved - it can be tricky to be sure that organic products really are organic! Oh wow what a fab selection! They look like such fab products and amazing saving too! I need to try it! What a lovely collection, I particualarly like the sound of the TLC balm, I need some of that in my life! Oh I’ve never heard of any of these but environment friendly has to be goo right! This sounds like a great beauty box ad i love that it's organic. What a great selection! I'd love to try the Pinks Boutique Serum.